So yesterday I investigated this approach. 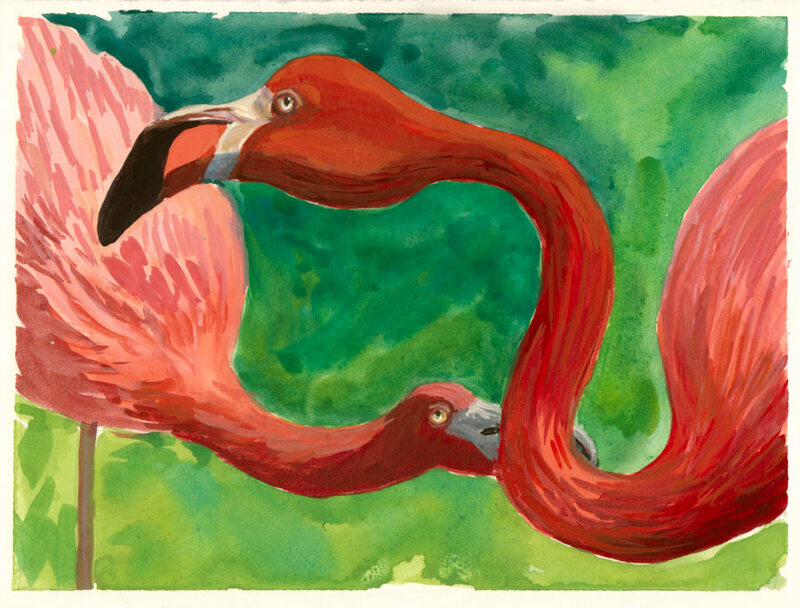 I painted the flamingoes above from a photo I took at Six Flags last month. Then I tried various pens and tracing papers. I also sent a message to India asking if she’d be willing to provide more information about the process. She wrote back quickly (like most artists online, she was very generous in sharing her wisdom) but not before I’d tried a number of things that didn’t work, which I’ll list at the end. Maira supplied the captions on heavy tracing paper; I clearly recall having to put a sheet of white cardstock on top of them while scanning, to get a clean background. I tried this approach, using Canson Extra Heavy Vidalon Tracing Pad which, according to their labeling is “the most transparent surface, strong, clear excellent surface for pencil or ink.” It worked perfectly! The great thing is that the original artwork is still pristine, despite all the different ways I messed up the printing (spelled camouflage wrong on one take, wrote “too” instead of “to” etc.). When I didn’t like the printing on the bottom I redid it in on another piece of vellum and scanned it to another layer. I think the pen was more inky though, as it looks thicker and darker than the rest. Roz Stendahl added, “I also, however, write on top of my gouache paintings all the time. Staedtler Pigment Liners, Faber Castel Pit Artist Brush Pens, Pentel Pocket Brush Pens, and dip pen with Ziller Acrylic inks (I like their Glossy Black which I think is the best black ink in the world). All those work fab for me. Drawing with ink on regular tracing paper and scanning the art and lettering together together (tracing paper created cloudiness over the artwork). Scanning the tracing paper separately and layering them in Photoshop. I copied the lettering specifying “transparent background” and pasted onto the scan of the painting, but while the background was transparent, all the spaces INSIDE letters such as O B D, were white, which looks sort of cute, but not what I’m going for. Drew with ink on prepared acetate, designed to accept wet media without beading up. Tried numerous pens and most smeared, even when “dry” except for two permanent markers designed for writing on shiny surfaces, but the ink color was too pale. I finally used dip pen with acrylic ink and that worked and didn’t smear and then I could scan them together. But the acetate is expensive, and not as pleasant to work with a dip pen as the vellum/tracing paper was. Thanks Jana for the mention. In photoshop you can hold the shift key and continue with the transparent eraser to get the counters. Let me know if you try the vellum. I did (the Vidalon on the image with the text is vellum) and it worked great and was enjoyable to work with! Do you always separate the lettering and the artwork on your beautiful calligraphed work? I always assumed it was painted right on the artwork which would be so scary, if there was a single misspelling or slip of the hand!). I really enjoyed reading this. It’s lovely that the generosity of others helped you find a solution. I love these guoache illus. Jana! a perfect medium and humor for these flamingoes! Thanks for sharing the process, Jana (I love blog postings that do that). The colors of this painting are magnificent! It just pops off the screen, and the printing over top didn’t detract from the colors at all. Wow! Thanks for the explanation. So it’s using Photoshop which I haven’t got – only an old version called Photoedit. Anyway I’m working out a way of putting two pictures together using Picasa but it’s only turning the pictures into transparent – which is still fun as you get some surprising results. Picasa also does allow for words on top of a picture and you just type them in and choose font etc. Great post and I love MK’s work also. I ‘m impatient for her to publish another!!! I’m pretty sure when you scan the painting and then print it, the white won’t print since printers think the white = the white of the paper. So you shouldn’t see a white box. Try it and see what happens. Let me know if that doesn’t work. Hi there! Thanks for your infinite help. I love gouache, and have only recently decided to create more journals with my paintings – thanks to you and the ever inspiring Maira Kalman. Do you have any idea how to use a similar method with photoshop, but make the writing white over an image? Completely stuck! Thanks for sharing this information about gouache and ink! Love your flamingos! I am planning to see the Maira Kalman exhibit, which is currently at the Skirball Cultural Center in LA. Her work is phenomenal. I have been using watercolor for travel sketchbooks, and am interested in trying gouache. Do you use a separate set of brushes when you work in gouache? I would appreciate any suggestions. Thanks Debbie. Yes I do use separate brushes. I read that gouache is harder on fine brushes than watercolor so I tend to use cheaper synthetic brushes with gouache. You might want to take a look at Roz Stendahl’s blog http://rozwoundup.typepad.com and so a search for gouache. She uses it a lot in her sketchbooks and has posted numerous helpful pieces about it. You can search on her blog for goauche.